Section 18 of the Children’s Act, 38 of 2005 places the responsibility on the parents of a child to contribute to the maintenance of the child. 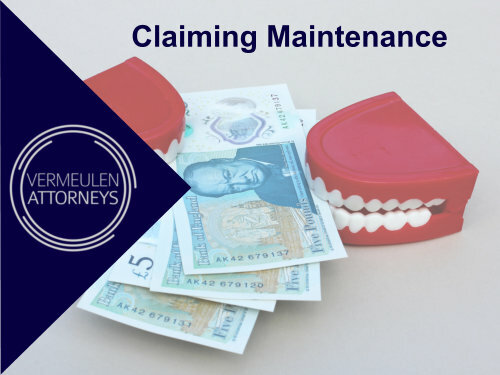 This article endeavours in setting out the process of claiming the maintenance your child is entitled to at Maintenance Court. Maintenance is governed by the Maintenance Act 99 of 1998. This article will set out a step-by-step process that needs to be followed in this regard. It will also deal with a few frequently asked questions (FAQ’s) surrounding the topic of maintenance. Maintenance refers to the duty to support and provide for another person. Maintenance is normally claimed for minor children and is used to cover their needs including, but not being limited to, clothing, school fees, food, shelter and medical expenses. Step 1: Attend the Magistrate’s Court closest to your home and go the Maintenance Court section in order to verify if that is the correct Court at which to make a maintenance application. Step 2: Complete “Form A: Application for maintenance order” (Form J101). This form is obtained at the Maintenance office at Court. Step 3: Once Form A has been completed, annex to the form proof of your monthly expenses (i.e receipts), 3 months bank statements, 3 months pay slips, the minor child’s certified birth certificate, a certified copy of your ID, a certified copy of your marriage certificate (should you and your spouse still be married), proof of residence and a copy of the Court order/Deed of settlement (if divorced), as well as any other relevant documentation that may assist your application. Step 4: The Court will then provide you with a court date on which you and the Respondent (being the person you are claiming maintenance from) should appear in Court. Step 5: The Court (i.e a maintenance officer) will then investigate your application and will serve a summons (a letter informing the Respondent that they must attend at Court) on the Respondent. Step 6: The Respondent then decides whether to agree to the amount in maintenance that you are claiming; alternatively whether to oppose the amount and set out their case regarding the reason that they cannot pay the amount of maintenance you have requested. Step 7: In the event the Respondent agrees to pay the maintenance you are claiming, the Court will make such maintenance an order and may do so without the parties having to appear at Court. Step 8: Should the Respondent not agree to the amount of maintenance you are claiming, both parties will have to appear at court and set out their cases. Step 9: If the court finds the Respondent liable to pay maintenance, it will make an order. The amount of maintenance payable will depend on the relevant factors presented to Court. Who has to pay maintenance? Both parents of a child have the duty to support a child financially. This is provided for in Section18(2)(d) of the Children’s Act, 38 of 2005. The parent with whom the child is primarily resident is allowed to claim maintenance from the non-resident parent. The non-resident parent is then liable to pay maintenance for the child. Am I allowed to claim maintenance from my child’s grandparents? In the event where your spouse is not able to pay maintenance for the child, you are entitled to claim maintenance from the grandparents of the child. How much maintenance must my child get? The law does not provide for a set amount of maintenance that a child is entitled to. The amount of maintenance that should be paid for a child is dependent on the needs of a child and the financial means of the parents of the child. My child has turned 18 years of age but is not self-supporting yet, what now? If a child has already turned 18 years old, however they are not self-supporting yet (i.e they are attending university after matric and are therefore not employed), maintenance for that child must continue to be paid. The maintenance in this specific case, however, must be paid directly into the child’s bank account and no longer into the parent’s bank account. Can I change the amount of maintenance being claimed once an order has been granted? Yes, this can be done. This happens when there is a change in financial circumstances.